Well, the end of the vegetable garden, anyway. Just yesterday morning I said to a friend, “How about some leek and potato soup this week? I have a ton of leeks and they need to be harvested before the ground freezes.” It’s a good thing she agreed to take a pot of it off my hands–it sent me out to the garden this morning to make my discovery: the ground has finally frozen. The soil in my raised planters has, until now, been very soft. For weeks I have been pulling leeks out easily, shaking soil off the roots and enjoying the last bit of produce before winter sets in. I was still entertaining dreams of getting manure on the beds before winter. Oh well–it will have to wait until spring now. I guess that’s one less thing on my to-do list. When I went out to pick the leeks and first encountered the hard ground, I laughed to myself. Such an optimist, I am, thinking that here in December the weather wouldn’t get too cold for my plants. But after a chuckle or two, and pulling in vain at those leeks, I realized I faced a problem: they were completely, hopelessly stuck. No problem, I said to myself (I talk to myself alot out in the garden). I will fetch a trowel or even a spade and dig them up. I trotted off to find one from the garage and came back, still hopeful. Unfortunately, all of my hope evaporated when the blade of that shovel touched the earth. The hard ground refused to yield even a teesy tiny bit. Drat. Time for a compromise. And for a new tool. I put the shovel away and found my snips (seccateurs). 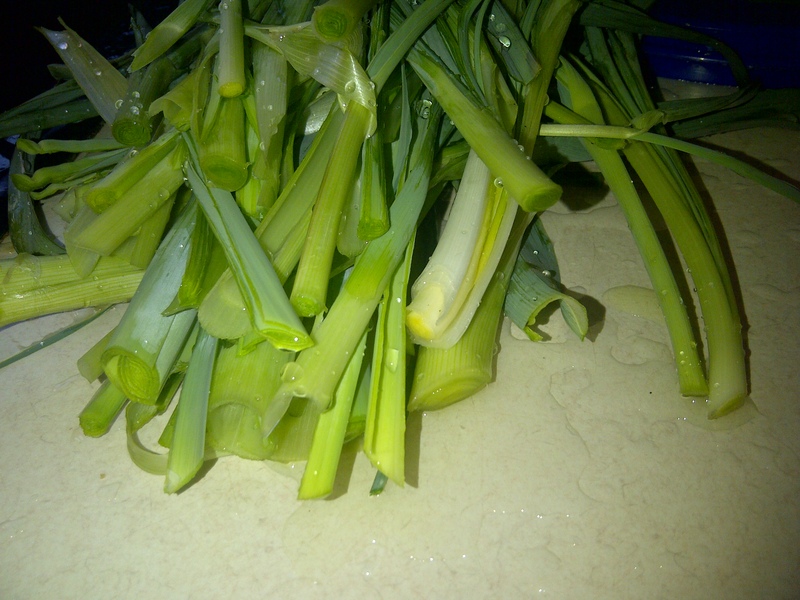 I cut each leek at ground level, being careful not to let them fall apart. I cut every last one of them, too, since I don’t forsee a thaw anytime soon. Some were big and fat, others still skinny and pale. Thankfully, they will all taste just fine by the time they reach my pot of soup. As I trudged into the house with my shorter-than-usual leeks, I felt a little sad. It was a glorious summer, with sabbatical adventures, garden experiments, and long days with the kids. In my hands I held the last few remnants of green, the last few wisps of relaxation and fun. Goodbye, sabbatical summer. I had a really nice time. As I washed and chopped my leeks at the kitchen counter (and leeks do take alot of washing to get every little bit of sand from between those leaves) I watched the sun, already past its zenith even so early in the day. It won’t be long and the days will be getting longer again, I thought. Soon it will be February–it’s really only a matter of weeks now–and it will time to plant a whole new season of leeks. Yes, this season has come to an end but the next one is already on the horizon. That is encouragement we all can use. Ah! For the arrival of winter — for this I wait in hopeful expectation! It’s still warm here. It has been very warm here, too. We are still waiting for the real winter to arrive! Planting leeks in February is only a dream here in New Hampshire. Our ground doesn’t start to thaw until the end of March or the beginning of April usually. Last year we had a big snow storm on April 1st. 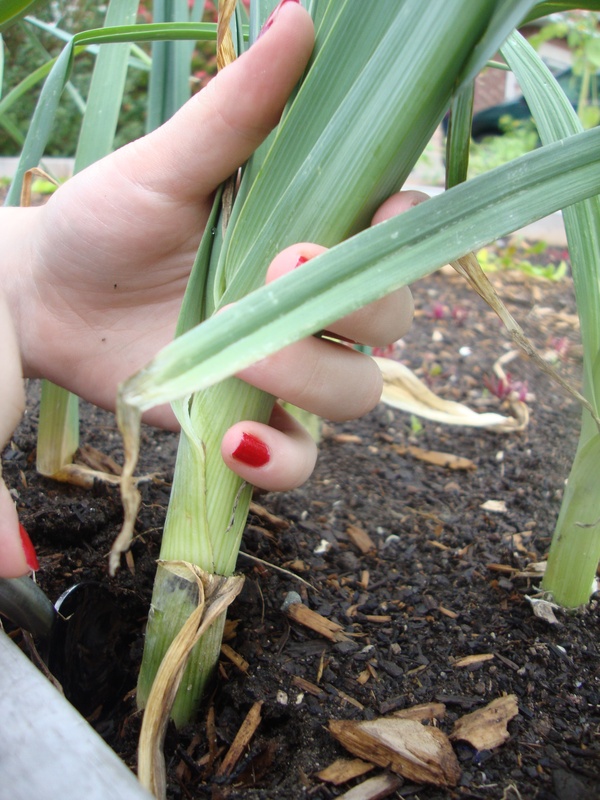 I start my leeks indoors in pots as early as I can so that they get big and fat by the end of summer (leeks really do take a long time to grow). They are very easy to grow in small pots, though, because they are so slender. They don’t mind making do on a window ledge until the snow outside has passed, when I can I pop them into the garden. I wanted to stop by again to say that I hope you have a joyous Christmas. Thanks so much! Christmas was intensely busy, but wonderful nonetheless. I hope that yours was joyous, too, and full of un and feasting!